At MAD Kings we are obsessed by finding the latest and greatest growth tools . Gotta try them all … However, there we also have some dearest and nearest tools that we would like to share with you. Hotjar is a new powerful tool that reveals the online behaviour and voice of your users. By combining both A) Analysis and B) Feedback tools, Hotjar gives you the ‘big picture’ of how to improve your site’s user experience and performance (conversion rates). Admit it, you secret Star Wars fan, always wanted to build a chat bot, didn’t you? 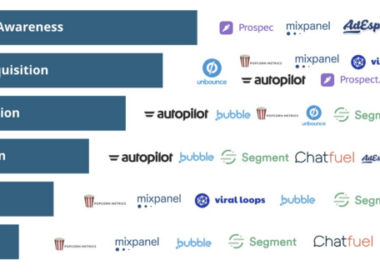  Not you can, in 10min with Chatfuel Facebook Messenger Bots have been around for almost two years and our bet is that they are here to stay, since more than 1 billion people uses Messenger as a communication platform. We challenge to create your very first bot- NO CODING, for free tool . C’mon, you will love it. Ping us for help if you need some. Drift is a conversation-driven marketing and sales platform that automatically turn your website into qualified sales meeting. Do you know experiments that Guillaume Cabane did at Segment? What is your favourite tool? Post a comment, we would love to get more suggestions.